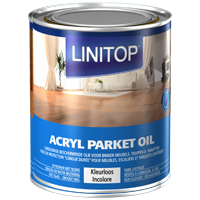 Water-based oil enriched with vegetable oil, combined with modified polyurethane resins. 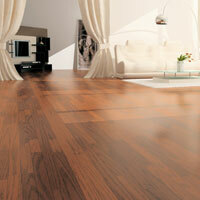 Protects indoor wood subject to abrasion and water splashes, while preserving its natural colour. Excellent resistance to wet or dry abrasion, scratches and water splashes. Water-repellent: withstands standing water, chemical products (including ammoniated ones). Perfectly suitable for wet rooms such as bathrooms. Very easy to use: does not require any buffing, neither manually or with a buffing machine. It is applied directly to the prepared surface. Not slippery or greasy. Does not yellow over time. Easily washed. Fast-drying. Odourless: job completed in half a day. Can be coloured directly with a universal colouring (max. 3 %). Two finishes possible: matt or “oil polished” appearance. Local restoration possible or total restoration in one coat. 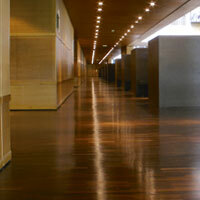 Parquet, stairs, floors, work surfaces, panelling, indoor framework, furniture, etc. Can be used on all wood types normally used for this type of structure (coniferous wood, broadleaved wood, tropical hardwood, etc). Ideal for all rooms that have to be used quickly afterwards and that require simplified maintenance. Apply a coat of Acryl Prim. After drying and without sanding, finish with two coats of Acryl Parket, sanding between these two coats. Wait at least 48 hours before putting back furniture, protecting the legs with pads. Application tools : Brush, microfibre roller, spray gun. Recoatable : 4 to 12h.